This cake won’t fail to impress, especially when guests see the stunning layers inside. Making all 24 crêpes is a bit of a ‘crêpeathon’, but it can be done in stages by preparing half the batter at a time. 1. To make the mousse filling, place the chocolate, marshmallows, butter and just-boiled water in a large saucepan set over a low heat. Stir until melted and smooth, then pour into a large bowl and leave to cool. 2. To prepare the crêpe batter, place all the ingredients except the butter in a food processor and blend until smooth. Pour into a large jug, cover with cling film and chill in the fridge for at least 30 minutes. 3. Meanwhile, prepare the compote. Place the sugar and orange juice in a medium pan and bring to the boil while stirring. Add the cranberries, reduce the heat and simmer for 5 to 6 minutes, until tender but still holding their shape. Remove and leave to cool. 4. To finish making the mousse, whip the cream and vanilla extract until thick. Once the chocolate mixture is cool, fold the cream through it until well combined. Cover and refrigerate for 1 hour, until it’s beginning to set. 5. To cook the crêpes, use a piece of kitchen paper to rub a little melted butter all over a 20cm non-stick crêpe or frying pan and place on a medium heat. Add a small ladleful of batter, about 60ml, to the centre and swirl the pan. Cook for about 45 seconds, until set on the bottom. Flip over and cook for another 30 seconds, until cooked through. Tip onto parchment paper and repeat to make 24 crêpes in total, rubbing the pan with more melted butter in between batches. Leave to cool. 6. 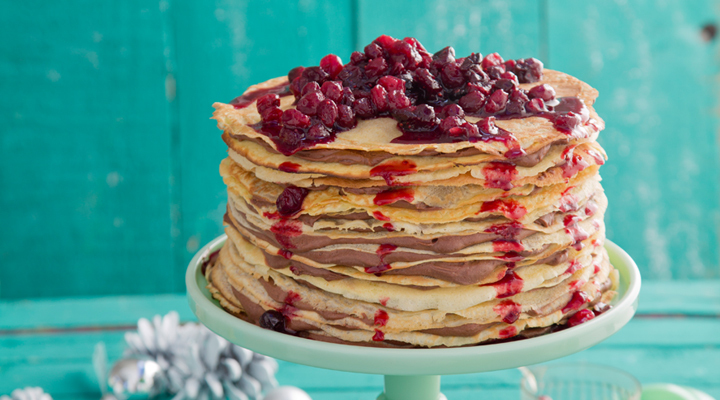 To assemble, lay one crêpe in the centre of a cake stand and spread with about 4 tablespoons of the mousse filling. Lay another crêpe on top and spread with filling again. Continue to layer until all the crêpes and filling are used up, finishing with a crêpe. Cover and refrigerate for at least 1 hour or up to 24 hours in advance, until firm. 7. When ready to serve, spoon the cranberry compote on top, letting some of the juices drizzle down the sides. Cut into wedges and serve with softly whipped cream. TIP: To make chocolate crepes, substitute 50g of plain flour for that amount of cocoa powder in the batter mixture. The layers won't be so obvious when cut into, but they will be just as delicious!